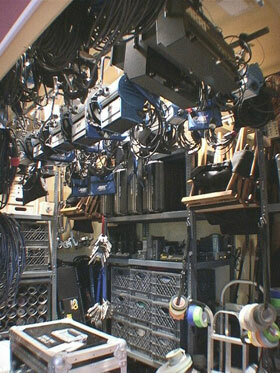 One of the most unique features of Full Moon and High Tide Studios is our equipment storage room. Not just a storage room, the equipment room contains an amazing amount of grip and lighting equipment from a wide variety of manufacturers like Arri studio lights, Matthews C-Stands, Kino-Flo lighting and audio/video cable. You can choose incandescent or fluorescent fixtures like Arri lights 150 watt, 300 watt, 650 watt, 1k and 2k along with Soft 2k lights. A wide variety of Kino-Flo lights include the large four foot Image 40 DMX and the powerful but tiny Diva. Both daylight and incandescent bulbs (32k and 55k) are available. Matthews grip equipment is well represented at Full Moon & High Tide Studios. We have 12 C-Stands, 25 arms with gobo heads and a wide selection of clamps, arms, holders, pins and adapters. When you use the Full Moon & High Tide studio, you’ll have an outstanding and useful selection of equipment from the Equipment Room. If it isn’t in the Equipment Room, you don’t need it!